I am not a healer. I do not heal anyone. I think of myself as a stepping stone on a pathway of self-discovery. I create a space where people can learn how incredibly wonderful they are by teaching them to love themselves. 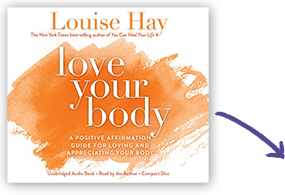 After years of individual counseling with clients and conducting hundreds of workshops and intensive training programs across the country and around the world, I found that there is only one thing that heals every problem, and that is: to know how to love yourself. Unfortunately, many of us will not love ourselves until we lose the weight, or get the job, or get the raise, or the boyfriend, or whatever. We often put conditions on our love. But we can change. We can love ourselves as we are right now! We are in the midst of enormous individual and global change. I believe that all of us who are living at this time chose to be here to be a part of these changes, to bring about change, and to transform the world from the old way of life to a more loving and peaceful existence. It’s the most powerful healing force there is. Many people don't practice building self-esteem daily because they don't realize that it's something that they can learn to do, no matter what experiences they have had in life.